Named after the founder of the University Press of Kentucky, the medallion is awarded to one book each year for highlighting the state’s history and culture. 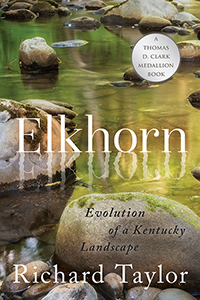 “Elkhorn” is published by the University Press and will be released on Sept. 21. “I’m honored to be a recipient of an award named for Dr. Clark, whom I knew and greatly admired for his writings, his character and his encouragement of others to look into the deep but shimmering well of Kentucky history,” Taylor said. He will receive the Clark Medallion at the Paul Sawyier Public Library in Frankfort on Wednesday, Sept. 26. On Tuesday, Oct. 23, at Transylvania, Taylor will give a reading from “Elkhorn.” The event, sponsored by the Thomas D. Clark Foundation, will be held in the Cowgill Center for Business, Economics and Education, Room 102 at 5:30 p.m. The reading is open to the public.